Three years passed since the first Dominion Card Lists were compiled, the skill level of all players raised and a lot of new knowledge is gained. A new expansion was released and everyone is eager to learn how the new cards rank. That means it's time for the 2015 edition of the Dominion Card Lists. I'm not the best web designer to make it look nice, but it works. There you can order the cards either all at once in a big list or by comparing two cards at a time. If you do the latter, the app will tell you when you're done and no new "card duel" is available anymore. I didn't include a registration or anything like that for this simple app. You can just login by your Goko name and any password you like. The next time you login you just have to remember the password you've set on your first login. I expect that nobody will trick me by using a user name of anyone else. I will also still accept PMs if you still want to do that in the old fashioned way. If you send me a PM please be sure that you put each card in order and don't miss any. If you don't know an expansion very well you can choose to leave it out. But be sure that if you want to include a card of a specific expansion, you have ro rank all cards of the expansion. There are no restriction with Promo cards, so if you don't know Summon very well, you can leave it out. I included extra lists for Prizes, individual Knights, Ruins and Events. These are optional, you don't have to rank them if you don't want. Submission deadline is the 31st of October 11:59pm UTC. When I post the results, I will also include the ususal statistic data. I will leave out my comments this time to not let you wait that long between posting my results. One important note: it seems you forgot Prince! I'm over halfway done I think, only need to do the two longest lists, $4 and $5 (and update $6+ once Prince is included). Prince is indeed not included yet. 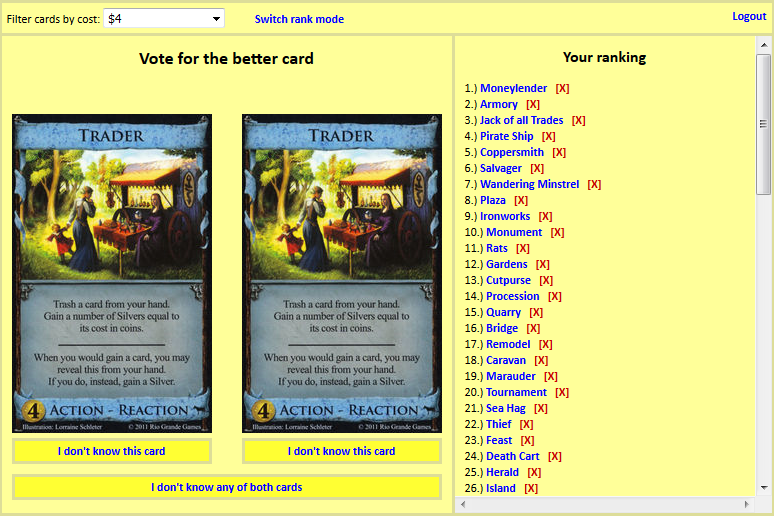 But I really like the "duelling", it makes it a lot easier for me to rank the cards I'm unsure about. Yeah I've recognized that as well, but I just logged in again and it appears to be there now. That's because it hasn't been released in English yet. Also, NOW I'm done voting - just dropped Prince in my list. If you don't know the card, just click on the respective link. Thanks a ton Qvist! I assume these will go on your YouTube channel like before, correct? Now I have a question. If you only do a partial rank, will you still include that? And is there a button to turn in your results, or can you view it? thanks! for those of us who don't know algorithms, how many comparisons do we expect to have to make before the whole thing is sorted? Weird, that shouldn't happen. I will look into it. It should be in average n * log (n) although my code might certainly not be optimal. That's roughly 160 comparisms for the biggest list ($5). I too had that same error after ignoring an Event, fyi. I have finished all of my lists except the cumulative one. Not sure if I'll go all the way through with it or not. Here's hoping people have seen the light and Sea Hag is no longer #1 for $4. I don't think that's correct (because only comparisons are important, we don't need to account for the merging). It should be exactly as many comparisons as there are cards in the list. I have it at #13 myself. Yeah, 29 seems low to me. It's probably at least deserving of 15th place. Part of it is that there are so many more ways to fight Curses now. I think it ended up 5th on mine. Anyway, still need to do all of the 5's, that's gonna take some time. I ended up with Sea Hag just under Jack. Thanks a lot for your work Qvist! This is the first time I participate in the voting and I'm excited. Takes a pretty long time but I won't rush my decisions. This happened to me like three times when I clicked the "don't know" button. It's a fairly consistent bug but I don't think it has any impact on the voting. Something screwy is going on. I went to check my ratings and everything was all jumbled up. Like on my $3 cards Loan is towards the top. My ratings were finalized. After I rated through the duel system, I then went and made any corrections via the list method and saved it. I have no idea what happened. Edit: I think what happened is that I rated the events and this caused some of my other ratings to get unseated. You probably created a loop (A>B, B>C, C>A) after reranking some of the Events. I solve that by deleting A>B after voting C>A. That means that you have to revote for only B to solve the problem. B was probably Loan in your case. I think having the events in both the $$ lists and a seperate Events list causes some problems. Every time I'm rating the Events it destroys my $$ ratings and vice versa. If we want to have both I think they should be rated without dependencies. Or we should either vote for them separeted as Events only or in the $$ ranges only. Rating consistently isn't easy, it appears. /Edit: After going over all $$ lists again, the Events list looks just fine despite it's saying there are ratings to do, but I guess I just don't touch it.